To establish an index that tracks and predicts economic growth in the city of Tallahassee. This will be accomplished using data collected from official sources in Leon County. This index is a measure of Tallahassee’s economic growth. This index is not a measure of the current status of the Tallahassee economy. Example: The index score being lower in March 2007 than November 2012 is not an indication that the November economy is better for businesses, but rather that the economy grew at a higher rate in November 2012 than it did in March 2007. Tracking economic growth provides a valuable tool in understanding the general direction of the economy. So Who's Behind The Index? The Tallahassee Economic Index (TEI) is a collaborative effort headed by First Franklin Financial Branch Manager and Financial Adviser Brett F. Ewing. Mr Ewing along with many dedicated staff members, interns from The Florida State University, and other local community members and leaders have spent years compiling and organizing data in an effort to bring an ongoing data based report to the Tallahassee Community about what kind of growth Tallahassee's economy is really experiencing. Our hope in underwriting this educational community project is to make available the use of this non-biased information to learn more about our local economy and gain insight about the local economy before making critical business or public policy decisions. Brett is a third generation Advisor and has worked in the Financial Services Industry for over 15 years. He believes in taking a steady conservative approach to investing. He graduated with a Bachelor of Science degree in Economics and Finance from The Florida State University in 1994 and received a Master of Business Administration from The University of Central Florida in 1996. Brett is a member of the FSU Alumni Association and the Tallahassee Lion’s Club where he served as Secretary, First Vice President and President. He is also a member of the Tallahassee Quarterback Club, an organization which created and sponsors the prestigious Biletnikoff Award. As a member of the TQBC, he held positions on the High School Awards Committee from 2008-2010, served as President in 2010, and functioned as a member of the Board of Directors from 2009-2013. He also served on the Board of Trustees for the TQBC Foundation. Brett has been a member of the Tallahassee Young Entrepreneurs Organization since 2010. Furthermore, he held a position on the Board of Directors for the Children's Home Society from 2007 until 2010. When not working, he enjoys spending time with his wife and three beautiful daughters, as well as playing golf, tennis, and working with local charities. Lance is from Sneads, FL and is a graduate of Florida State University. He holds a Bachelor of Arts degree in Finance and a minor in Accounting. He is a member of the FSU Alumni Association, The Tallahassee Chamber of Commerce, and The Tallahassee Quarterback Club. He has also served on the TQB Club's High School Awards Committee. Mr. Mitchell takes pride in spending time with each client helping them work toward their own personal investment goals. He believes in a steady and conservative approach to investing that stresses the importance of capital preservation. Tré is a proud Tallahassee native. He started working at First Franklin right after he received his Master of Science in Finance in May of 2013. Tré also has a Bachelor of Science in Finance and a Minor in Economics, all from Florida State University. He has been featured in several local Fishing magazines in the past few years. In his spare time Tré enjoys fishing, boating, and spending time with his friends and family. Mike DuMond specializes in labor and employment issues, including matters in preparation for litigation, arbitration, monitoring, and settlement. His clients have included state and local governments, multi-facility retailers, production facilities, and educational institutions currently at Charles River Associates (CRA). Prior to joining CRA, Dr. DuMond was a research economist with ERS Group, Inc. In this role, he conducted economic and statistical analyses involving discrimination allegations of gender, race, and age in a variety of employment practices, including selection, termination, and compensation as well as Fair Labor Standards Act compliance. Prior to ERS Group, Dr. DuMond worked as the director of demographic research at the headquarters of Blockbuster Inc where he developed optimal pricing strategies and recommended merchandise adjustments to better match the demographic profiles of each store’s customer base. He has published research relating to compensation and selection procedures in professional economic journals such as Economic Inquiry, Industrial Labor Relations Review, and the Journal of Sports Economics. In addition, Dr. DuMond teaches labor economics and computer programming as an adjunct professor at Florida State University. Matt is from Valrico, Florida and was a quantitative intern for First Franklin Financial from September 2012 through April 2013. He graduated from The Florida State University in May of 2013 with a Bachelor of Science degree in Statistics and Applied Economics. After graduating from FSU, Matt moved back to the Tampa area to begin a new position as a statistician – data analyst. When not crunching numbers, Matt enjoys playing piano as well as anything related to Florida State or Tampa Bay sports. Kristin was born and raised in Jacksonville, Florida and was a finance intern at First Franklin Financial Services from January 2012 through August 2012. She graduated from Florida State University in December 2012 with a Bachelor of Science degree in Finance and Real Estate. Currently she lives in Atlanta, Georgia working for Prudential Real Estate Investors as an Investment Analyst with a primary focus on acquisitions, transactions, and asset management within the senior housing market. When not working, Kristin enjoys working out, traveling, yoga, and cooking. All sales data is collected from the monthly gross sales tax data released by MyFlorida.com. Only sales from Leon County are considered. Initial unemployment claims are collected from FloridaJobs.org. Building permits are collected and summed from TalGov.com. Realtor sales and average home prices are collected from the Tallahassee Board of Realtors at tbrnet.org. Airport traffic is collected from Talgov.com/Airport. Monthly percent changes and yearly percent changes by month were calculated. Percentage changes were used as opposed to raw data, since the purpose of the index is to predict economic growth. A “separate index score” was calculated for both monthly rate of change and yearly rate of change by month. A weighted average (30 percent monthly change and 70 percent yearly change) of the two separate index scores was used to derive the overall index. Consider only the percentile of the percent changes for each indicator. 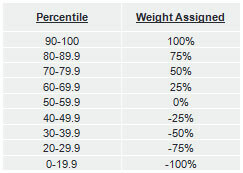 The amount of the weight added to the score for each month is determined by the table shown below. The overall monthly index score is multiplied by 0.3, the overall yearly index score is multiplied by 0.7, and the two products are then summed together to form the raw overall index. A 90 day moving average is applied to smooth the data.